Branchline’s Laser-Art structures are designed to be built with a minimum of fuss. These kits include precision laser cut wood parts engineered with tab and slot construction and utilize peel and stick trim for maximum ease of assembly. Detailed instructions with clear diagrams are included in every kit. Also included may be cast resin details for that finishing touch. A basic single family design, this house is the most compact of the group. It features three bedrooms upstairs with a kitchen, dining room and living room downstairs. A larger single family design, this plan is the designed for a larger family or group. It has four bedrooms upstairs with a kitchen, dining room and living room downstairs. Our N housing boom continues with this unfinished home yet to be completed. The framing is in, the plywood is going on and before long the building will be closed in. Kit includes wood parts with one piece walls featuring tab-and-slot construction for an easy to build but yet incredibly detailed structure. A pair of cute small homes built from Aladdin catalog plans in their 1917 catalog, these classic cottages will fit most anywhere. Another classic catalog design, the Avon can function equaly well as a single or a two-family home. Its compact size allows it to fit on just about any residential lot. These row houses were found in cities throughout the country. Our models are based on houses in Troy, NY as modeled on the RPI Club’s New England, Berkshire & Western layout. The kit includes parts to build one complete building with optional parts so that you can modify it to one of several different versions. Build a whole neighborhood! Another in our ongoing series of catalog houses, the Tucson was also featured in the 1917 Aladdin catalog. Its compact design can fit on any layout. A matching garage is also available. This classic small store once stood across the tracks from the O&W railroad station in Roscoe, NY. Over the years it housed a barber shop, confectionary store and bakery. The prototype was torn down in the 1960’s to make way for highway “improvements”. 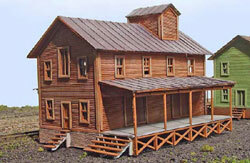 This classic barn will fit right into any rural layout and most any era. The kit offers interior detail and positionalable doors. This classic theater is typical of those found in communities throughout the country. Our kit includes a collection of vintage movie posters and marquee signs to help draw in the crowds! Located on the Rutland Railroad’s Addison branch, this classic Howe truss covered bridge was built in 1897 and served as a railroad bridge until 1951. Today it has been restored and is part of a rails-to-trails footpath. Kit inlcuded pre-cut wood parts with see-through side panels, tie rods, NBW (nut-bolt-washer) casting and more! The Suburban is based on a plan shown in the 1917 Aladdin catalog. “The Suburban” they said, “is well named, because how (sic) attractively this modern house will adorn the most desirable lot in the residential part of any of our progressive cities!” How can we say more? This classic single stall engine house will be at home on most layouts, From short lines and branches to logging and industrial lines. While typical of designs throughout the country, the prototype was built for the Central Vermont. It can provide protection for a variety of locomotives from moderate sized steam locos to almost any diesel. In addition to cover for the locomotive this building also includes a machine shop addition allowing light repairs to be made on the locomotives. Kit includes positionable doors and interior details. Typical small track side industrial building that while we call it a feed store, could be used for any number of different applications. Our kit comes complete with printed signs. Weimer’s is a classic water-powered grist mill. Here wheat would be ground into flour for local bakeries and homes. Kit includes water wheel, roof top water tank and sluiceway. The Valley Fuel Company has been in business for many years service servicing the needs of local farmers. This structure is typical of many found throughout the country with a track side loading dock along one side and two coal silos at one end. Kit includes laser cut wood siding, peel-and-stick trim, laser cut shingles, appropriate signs and complete instructions including weathering tips. Crosby Coal was located in Danby, VT. on the Rutland Railroad. Built in 1914 the building still stands today. Similar coal dealers could be found throughout the country. Hopper loads of coal would be unloaded into the coal bins from which the coal would be sold to local homes and businesses. Kit includes pre-cut wood parts with one-piece resin foundation, decal signs and more!